The ARVA Pro W (fka Link) was discontinued in 12/2016. Summary: The ARVA Pro W is a three-antenna avalanche transceiver that is similar to the Mammut Pulse (the Pro W was initially developed in partnership with Mammut, the company that developed the Pulse). The Pro W offers both analog and digital modes, supports selective marking of multiple burials and offers numerous configuration options. The ARVA Axis is the fewer-featured little brother to the Pro W and shares most of the Pro W's features. The Pro W was initially released under the product name "Link" in Europe in late-2010 and in the US in late-2011. The Link had an all-black housing. In October 2013 the Link was renamed the Pro W. The electronics in the Pro W were upgraded slightly (adding a new filter) and the software was updated, but the functionality is almost identical to the Link. I own both the white and black Links, but haven't tested them extensively. 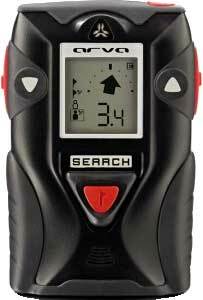 Searching: Similar to the Pulse, the Pro W has a freely-floating directional arrow that always points toward the transmitting beacon (even if you rotate it between beeps). The Pro W's arrow floats 180° and displays a U-Turn icon if you are moving away from the victim whereas the Pulse's directional arrow floats 360°. As with the Pulse, you must calibrate the compass after replacing the batteries or the directional arrow will be jerky. (To enter the configuration menu and calibrate the compass, turn off the beacon, hold down both side-buttons, and press-and-hold the on/off button for several seconds.) I've seen the Link repeatedly display a U-Turn which left me searching the same location (versus the Pulse's arrow simply pointing behind me). As with the Pulse and Axis, the Pro W can be toggled into analog mode by pressing and holding both side-buttons. Multiple Burials: When a signal is received by the ARVA Axis or the ARVA Pro W, a silhouette appears on the left side of the display. If multiple signals are received, additional silhouettes appear. Depending on how the signals overlap, the Axis and Pro W can display up to five silhouettes. When searching with the Pro W you can use the side-buttons to move between the silhouettes. You can then see the distance and direction to each signal. If there is a signal that is closer than the signal you are pursuing, the symbol appears. With the Pro W, you can continue searching for the more distant signal or select a different victim. The Axis will automatically switch to the nearest signal. When you are within 3 meters of a transmitter (or 5 meters if you change an internal configuration setting), the symbol appears on the screen. Pressing the button in the center of the search switch instructs the transceiver to "suppress" (aka, "mark") that signal. 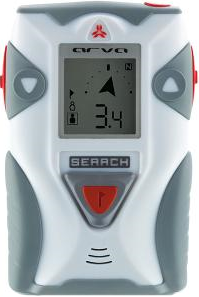 As with the Mammut Pulse, the ARVA Pro W can use the additional information that these transceivers transmit on the "w-link" frequency to better determine the number of transmitters and to do a better job ignoring a signal after marking. The Pro W's multiple burial features are powerful, but the power results in complexity that demands frequent practice. Controls: The Pro W is turned on/off using a single, rubber-coved push button. I've had problems with mine (and it hasn't seen that much use). As of recently, I can no longer turn it off. I'm sending it in for repairs. Two side-buttons are used to select options and a sliding button on the front changes between search and send mode. A button in the center of the sliding button is used to mark transmitters when searching for multiple transmitters and to confirm various actions (similar to an OK button on a computer). That's many more controls than other transceivers, but clear labeling of the buttons and a well designed screen make the controls less complex than they might otherwise be. I encountered a tiny annoyance when replacing the batteries: the screws were too tight to unscrew by hand and the slots in the screws are too narrow for even a thin American dime. I had to use an actual screwdriver to remove the screws (the Tracker3 also requires a screwdriver). W-Link: As with the Mammut Element and Pulse, the Pro W transmits additional information on the "w-link" frequency. This allows transceivers that transmit w-link data which is supposed to it easier for it to "mark" transceivers during a multiple victim search. It's uncertain whether this data is actually being used. And unlike the Mammut Pulse, the Pro W does not transmit "victim motion." In my testing, the Pulse's reception range was approximately 10 meters further than the Link. As mentioned above, the Pro W's directional arrow freely floats 180° and displays a U-Turn icon if you are moving away from the victim whereas the Pulse's directional arrow floats 360°. If the victim is wearing a Pulse or Pro W, the Pulse can display whether the victim is moving. ARVA chose not to display this information because they feel it complicates the search. The Pulse supports "directional tones." The Pulse provides three different "fine search" options. The Pro W's directional indicator disappears when the victim is 3 meters away. The Pulse allows this to be set to either 0 meters or 3 meters via its configuration menu. As mentioned above, the Pro W has more controls (i.e., an on/off switch, two side-buttons, a sliding switch to enter search mode, and a center button). The additional controls are relatively intuitive. If you turn on the Pro W when the sliding switch is already in the Search position, the message "Search?" is displayed with a blinking icon. It's very obvious that you need to press the center button to enter search mode. Likewise, when you press the on/off button to turn the unit off, an intuitive prompt asks you to confirm that you want to turn the unit off. The side-buttons are clearly labeled as up and down. These buttons, in conjunction with the center button, make selecting items more intuitive on the Pro W. On the Pulse, the left button moves down through the menu items (you can't move up) and the right button selects a menu option. The well-labeled side buttons in conjunction with the center button make selecting and marking multiple signals a little easier on the Pro W.
Although the Pulse's display is 25% larger than the Pro W's, they appear to have the same number of pixels. The Pro W displays five rows of options in its configuration menu versus one item in the Pulse, which makes navigating the list more intuitive (i.e., you know what item will be selected next if you move down the list). The Pro W is a few millimeters taller and wider than the Pulse. Its holster is much larger than the Pulse's. The Pro W (with holster) weighs 20% more than the Pulse. Some of the weight difference is due to the fact that the Pro W uses four AAA batteries versus three in the Pulse. The Pulse can use either alkaline or lithium batteries. At $459.59us retail, the Pro W is $30us less than the Pulse. Pros: Similar to Pulse in features. Cons: Compared to the Pulse, more buttons and functionally not as well implemented.